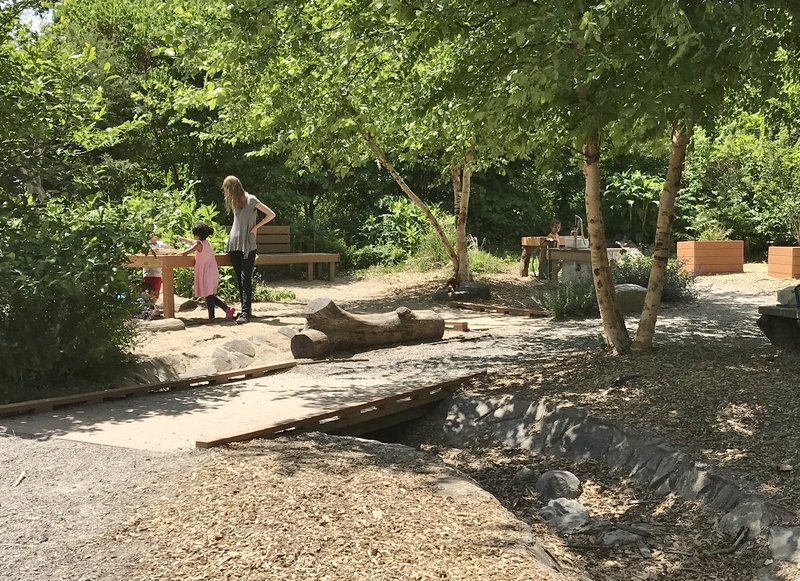 The “Nature Nook” is a delightful natural play space on the grounds of the Boston Nature Center & Wildlife Sanctuary, located in the Mattapan neighborhood of the city. 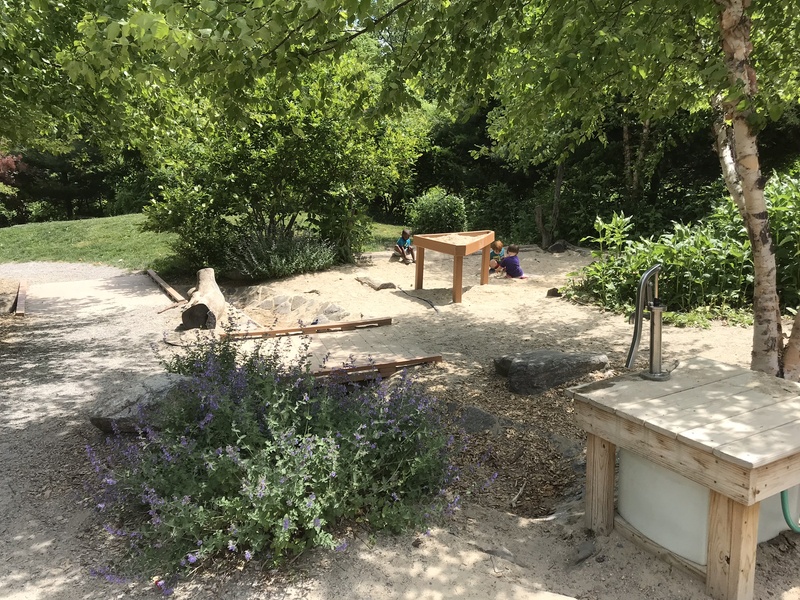 In about eight years since the playground’s construction, the vegetation has grown nicely to form a cozy play space consisting of several “rooms” of activity areas. 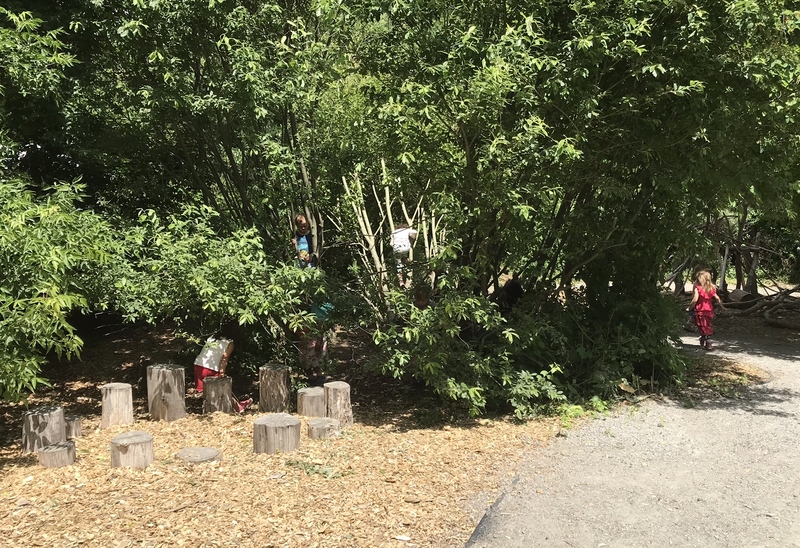 The playground includes all the important elements of nature-based play: water, sand/dirt, wood, plants, rocks, and hills. 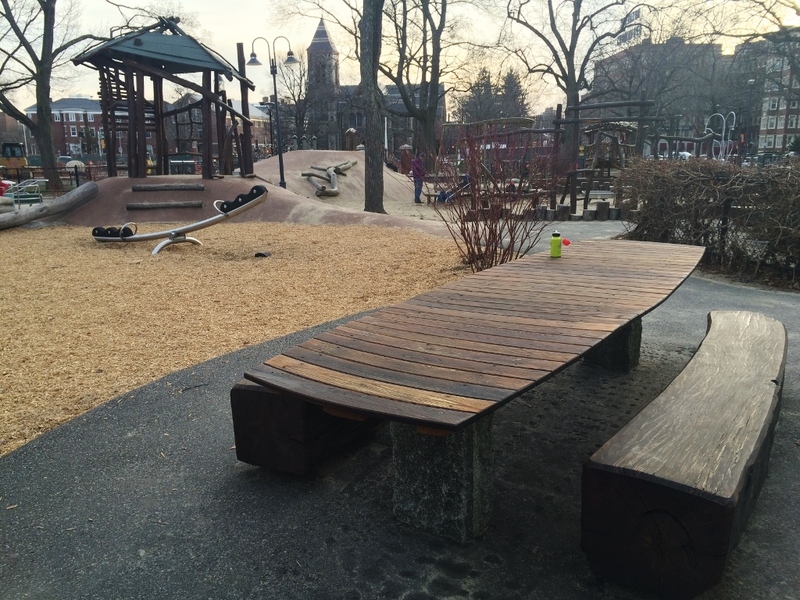 Additional features include a stage with seating, planters for gardening, music and art spaces, a building construction area, a gathering (seating) space, and a boardwalk. On a chilly, windy Sunday back in late March, I walked the majority of the Rose Kennedy Greenway while visiting Boston. I found that most areas were devoid of visitors, except for the North End Parks and the southern-most tip at the Chinatown gate (which always seems to have activity). 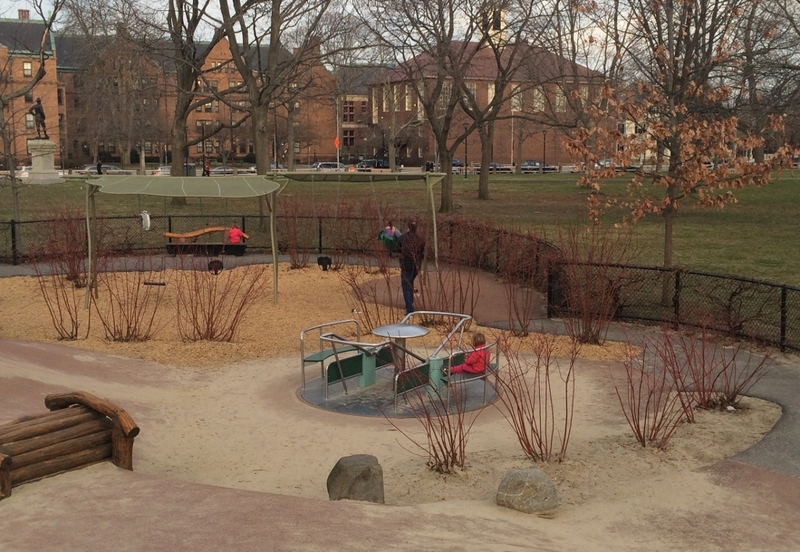 The two North End parcels (divided by a cross street) include a spacious steel pergola running along the east perimeter, facing a lawn and linear water play areas. I imagine that these spaces attract big crowds in summer, judging from the amount of use they got on the cold day I visited. 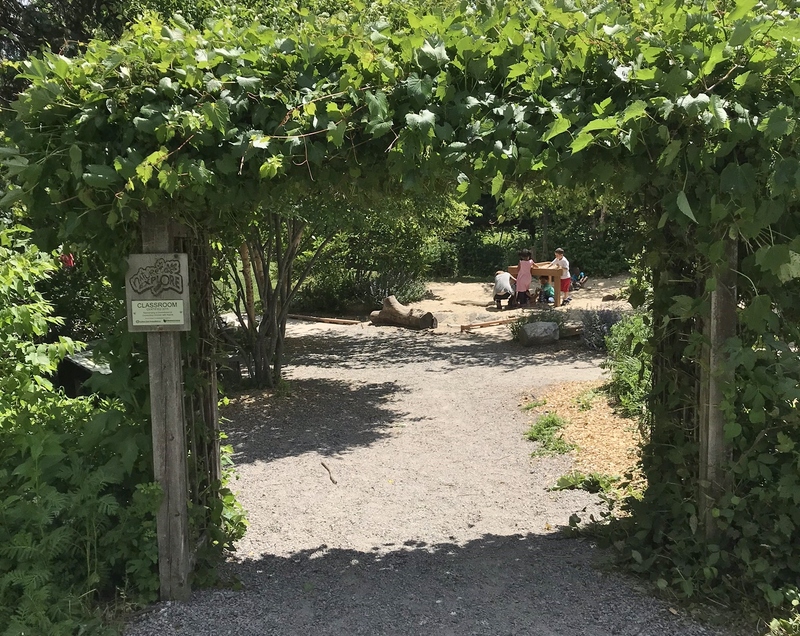 The parks feel quite connected to the city, with views in all directions of downtown and north end buildings, as well as the iconic Zakim bridge. However, ample plantings and some grade separations help to segregate these spaces comfortably from the busy perimeter streets. All the swinging benches in the pergolas were occupied at the time – unfortunately, I’ve heard that they’ve been removed due to maintenance/safety issues, and replaced with standard benches (which were there before). 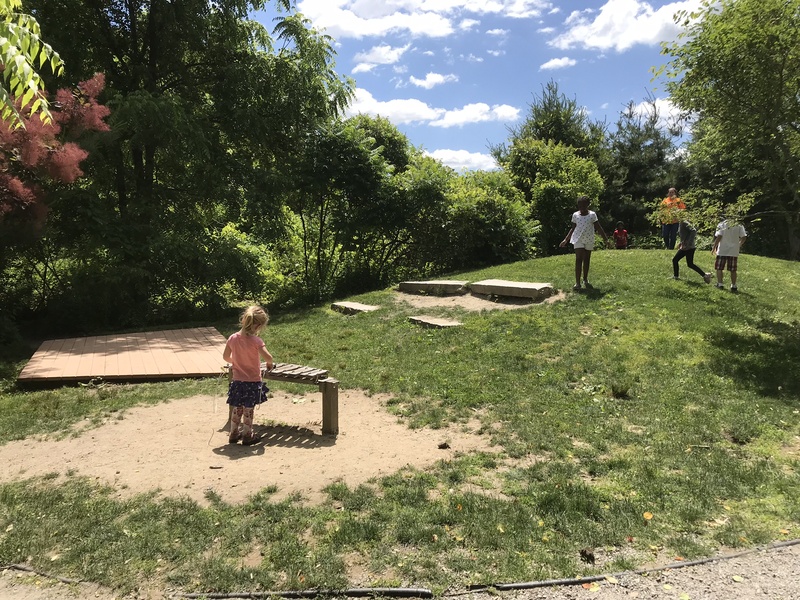 I finally got to visit the play area on the Common in Cambridge, Massachusetts – A superbly-designed space with hills, custom wooden structures, sand and water play areas, logs, plants, and other fun and unusual components. 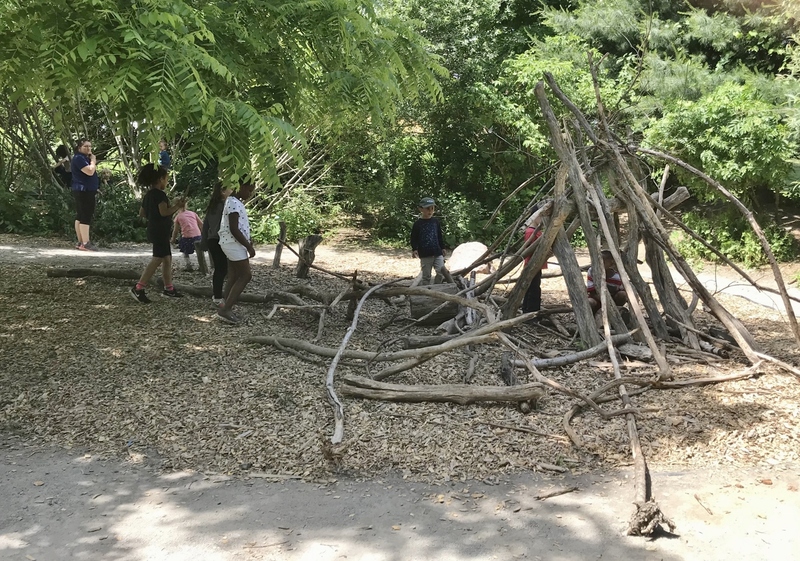 It includes many elements that help define a successful playground – one modeled on natural features that fosters imaginative, open-ended play. 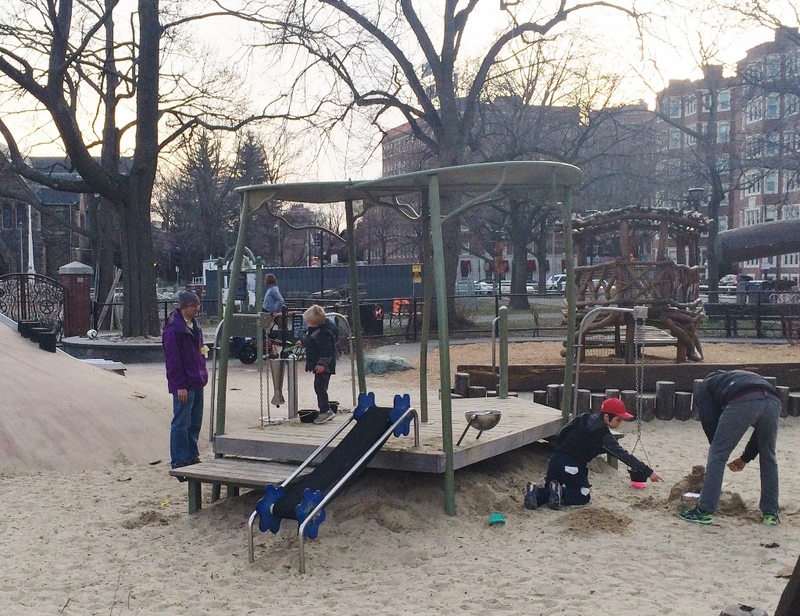 Although there weren’t many children there when I visited (likely due to cold weather and other plans on Easter Sunday), I could tell that the playground is well-used and loved, with sand tracked all over the place! Aside from inducing a sense of calm, moving water tends to have a psychologically cooling effect, and it softens or masks surrounding noise. 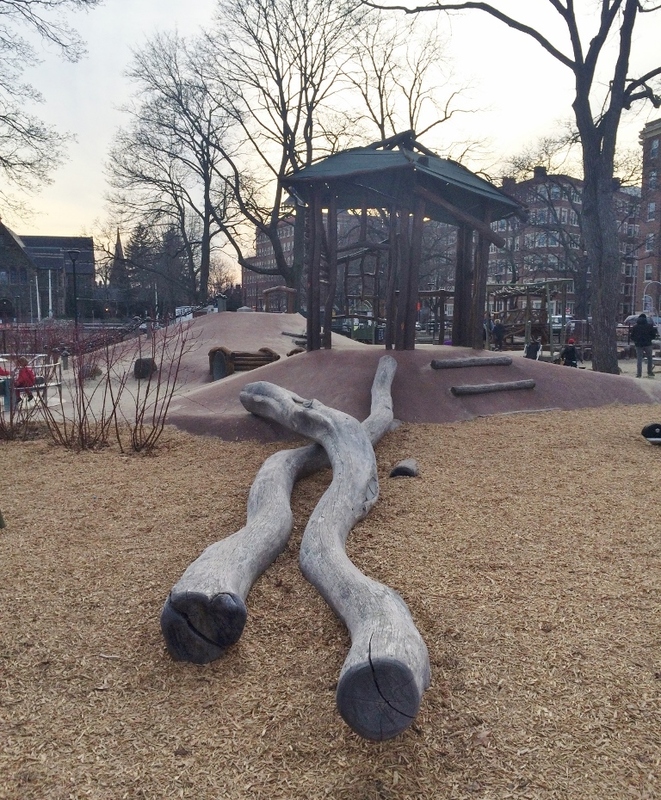 In the built landscape, it can be incorporated in many ways. Examples below illustrate some of that variety: a few of these features are meant to be interactive while others are not; several of them emphasize the water, which is more subtle or secondary in other cases; and some were designed to mimic nature whereas others are geometric in pattern or form. In all cases, the inclusion of water clearly adds to the appeal of these outdoor spaces. 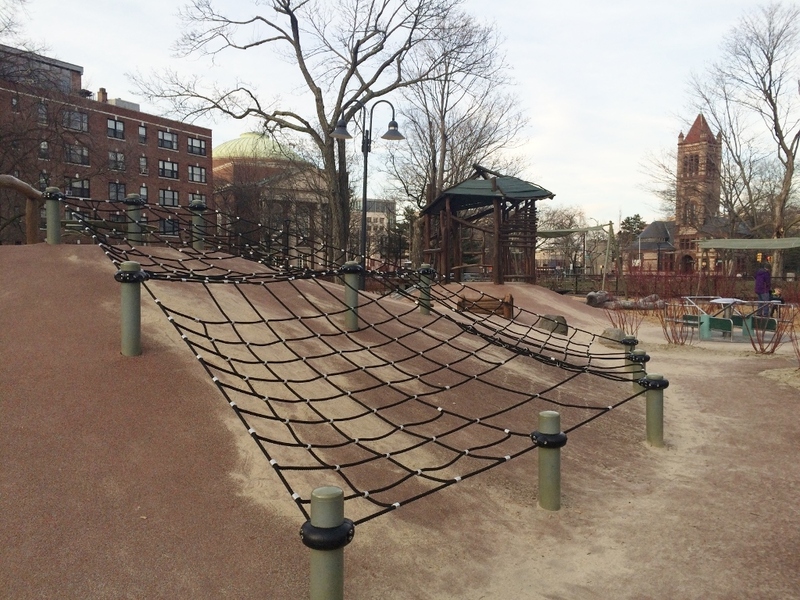 Starting in the 1950s and extending into the ‘70s, playground design took a creative turn, away from the galvanized steel structures of yore. 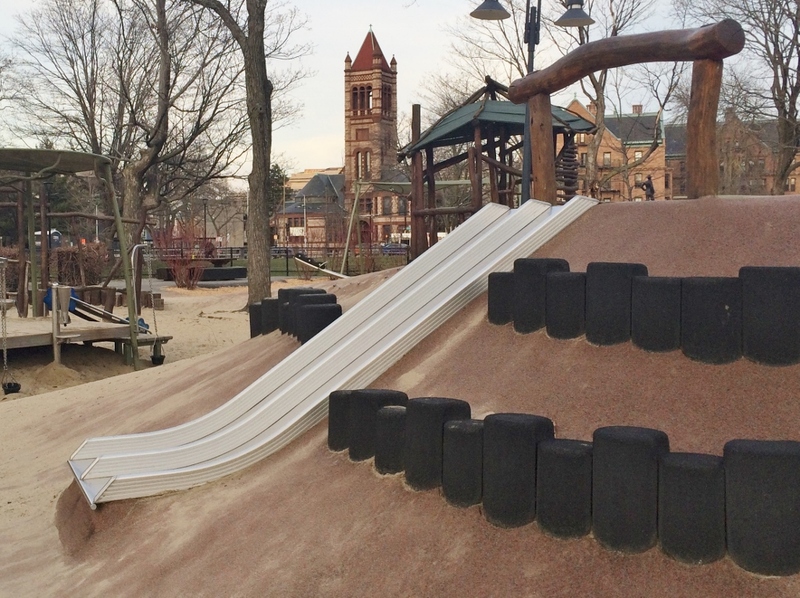 Instead of specifying manufactured pieces, designers began to customize entire play areas. Concrete, brick, and other hard materials were used extensively. 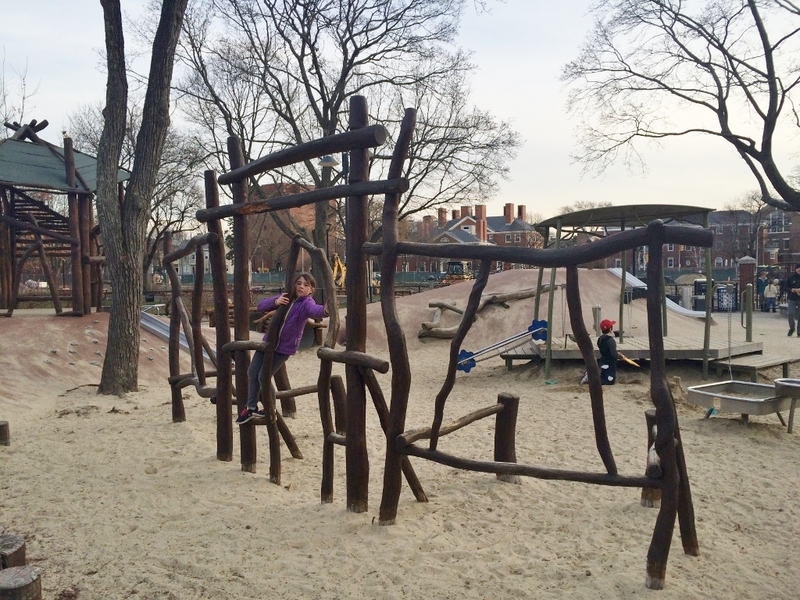 Several playgrounds built in this style can be found in Central Park, New York City, (photos below). Some of these have been upgraded, maintaining the integrity of the original designs, while complying with today’s safety standards. 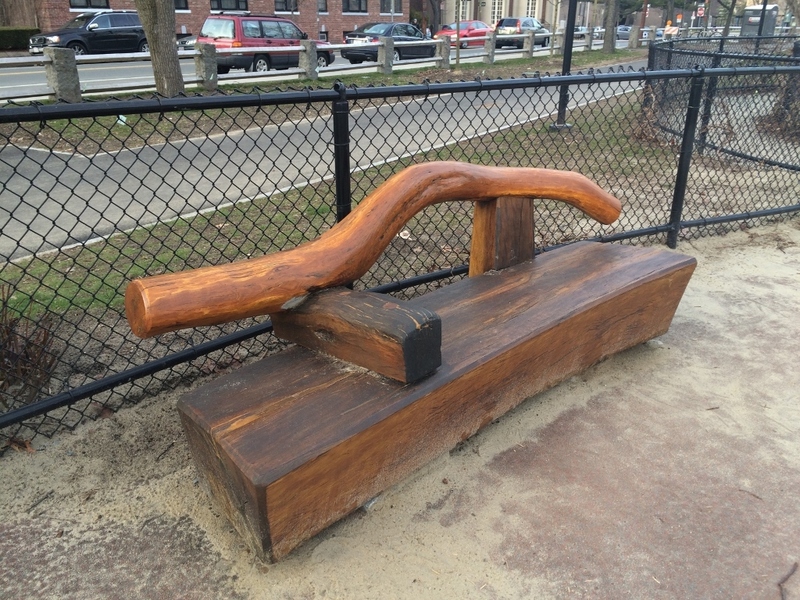 I like the sculptural qualities and connectivity of the climbers and other features, in addition to the water play areas incorporated in several of the playgrounds. However, I found the spaces to be rather cold and drab in appearance. 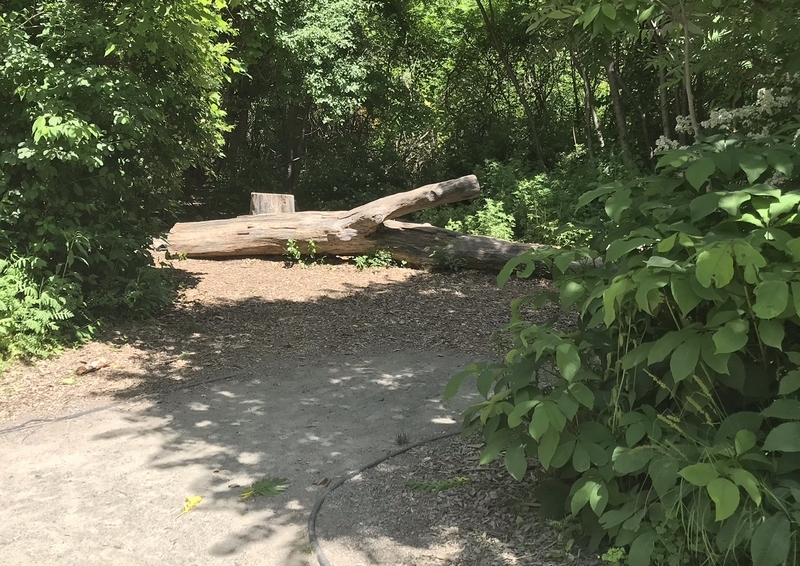 In my opinion, interspersing some low- and mid-sized plant materials throughout these playgrounds, (not just along the perimeters), would turn them into more inviting spaces and add play value to the sites. Citygarden is a relatively new (2009) sculpture park in downtown Saint Louis, Missouri, which I visited in late October of 2012. It encompasses two city blocks, and features over 20 works of art. 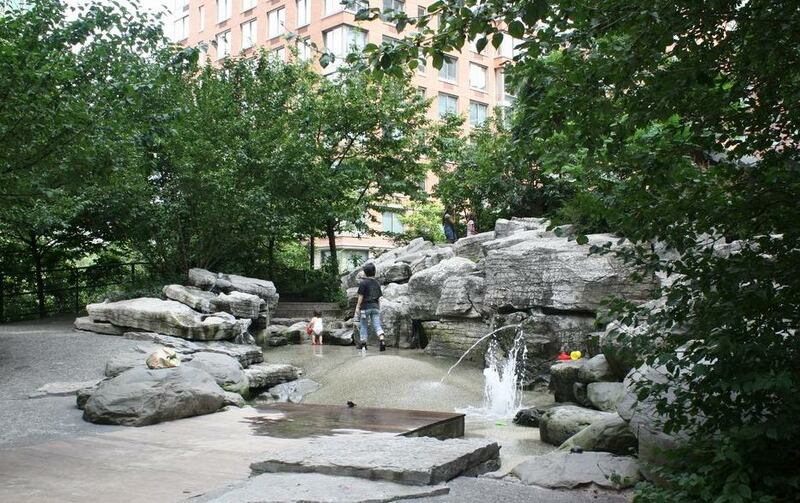 The design of this park was inspired by the natural characteristics of the region’s river environments. 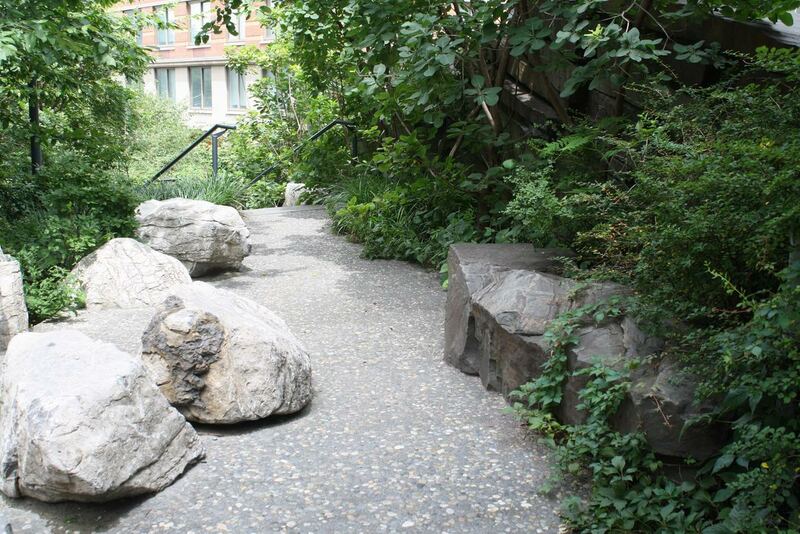 Along the northern edge of the property, urban terraces represent river bluffs; the central, lower segment loosely depicts a flood plain; and a serpentine seat wall symbolizes a river as it winds along the southern section of the park. In addition, Citygarden has several sustainable features, including six rain gardens and a green roof on the park’s café. 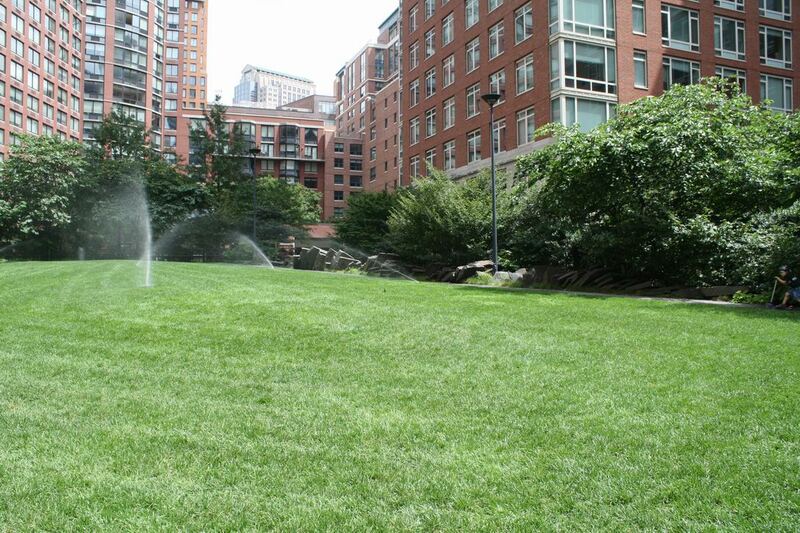 All features at Citygarden are meant to be experienced – there are no “Do not touch” signs to be found at the park. In warmer months, a thin sheet of water runs down the Tilted Disc in front of this sculpture. A series of steel arcs is one of the first sculptures in view when entering the park from the east. 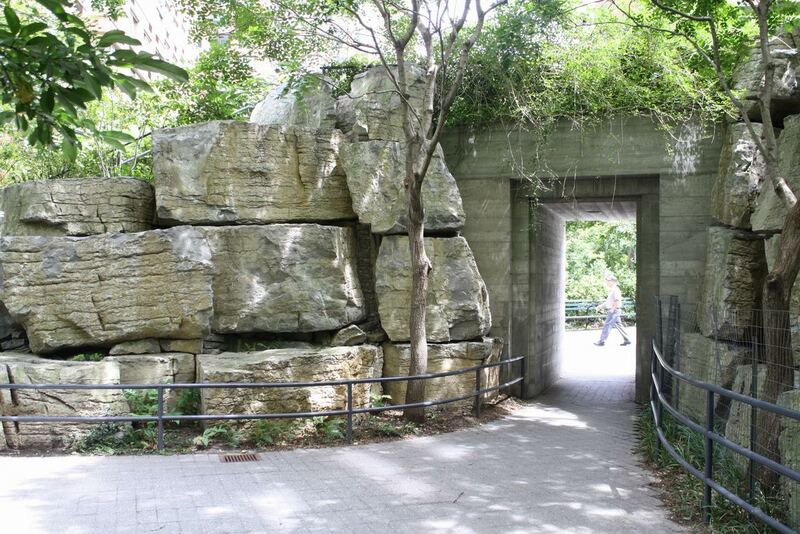 The Limestone Arc Wall, which gently curves across the length of the park, can be seen in the background. The long, rectangular Split Basin is situated in the northeast quadrant of the park. There are two levels to this basin, with a waterfall in between, where the Limestone Arc Wall intersects it. A modernist café is situated to the right in this photo. The lower portion of the Split Basin includes stepping stones. Park visitors check out the Video Wall. The Meander Wall continues along the southern section of the park, for 1,100 feet. 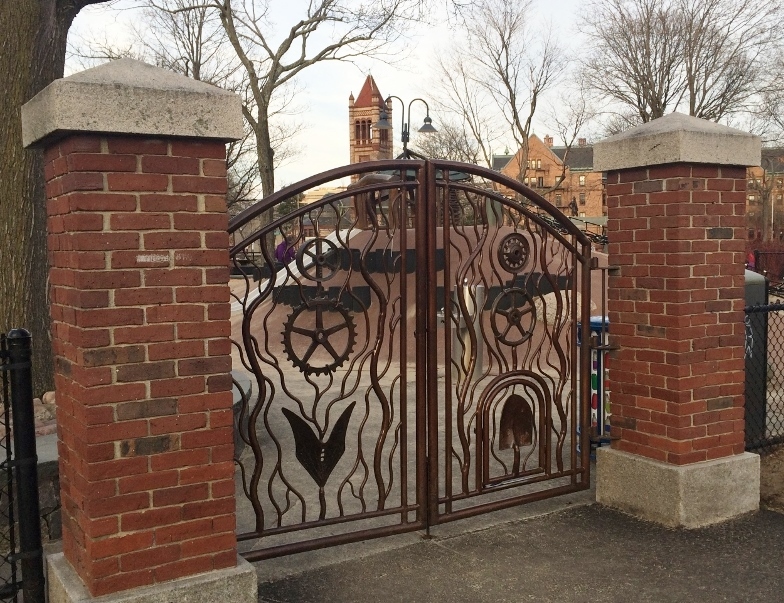 “The Door of Return” stands along the park’s central walkway. In summer, the Spray Plaza, behind this sculpture, includes numerous vertical water jets that spray in various patterns, with dancing lights at night. “Scarecrow” stands guard along a wooded walkway. “Zenit” adorns the summit of a hill at the park’s northwest corner. 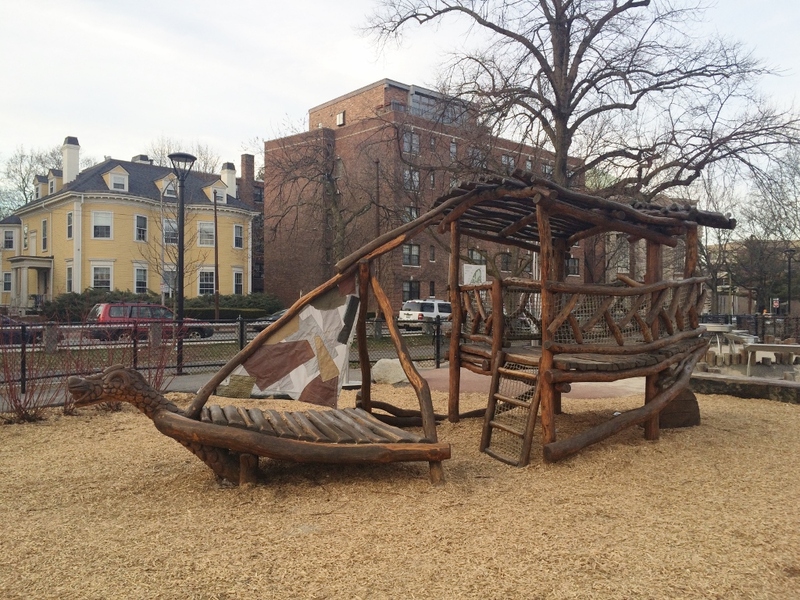 During a recent trip to lower Manhattan in NYC, I had the opportunity to visit Teardrop Park. 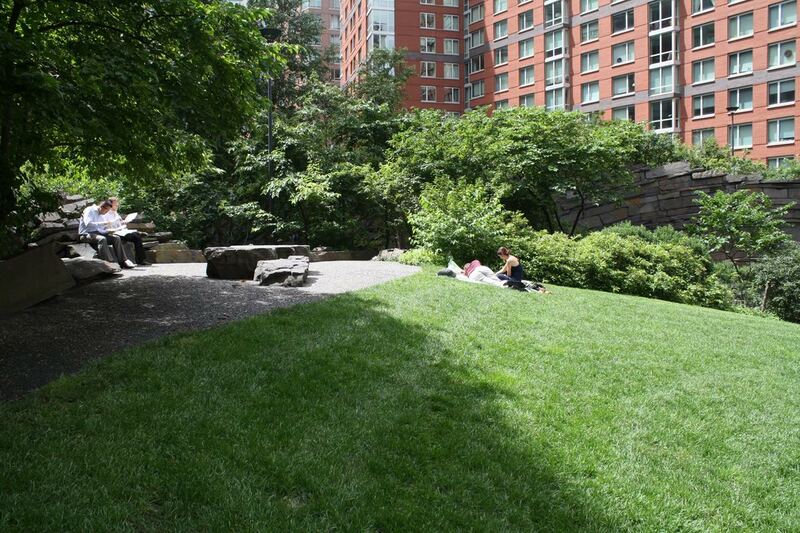 This little urban oasis in the Battery Park City neighborhood is situated between several high-rise residential buildings. 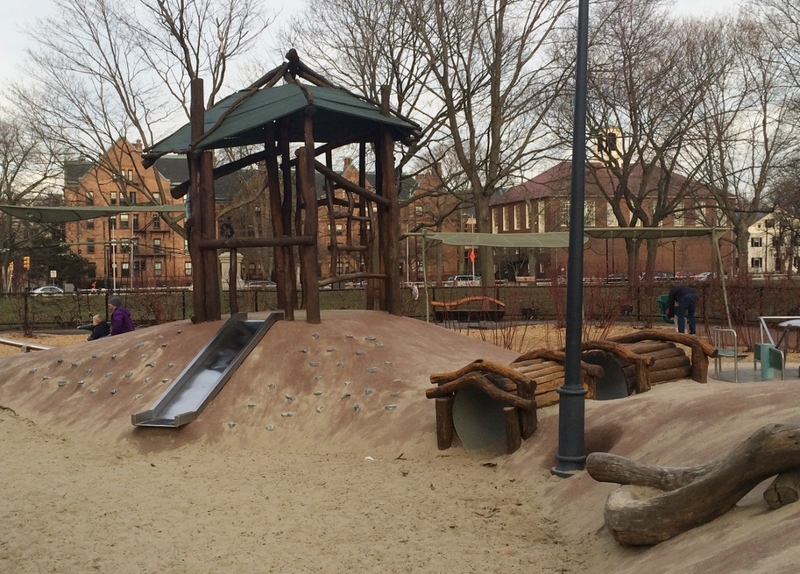 It includes natural play areas in its southern half, and lawns and walkways to the north. Much of the park was designed to represent a northeast forest environment, with rock outcrops, rolling hills, and lush (mostly native) vegetation. 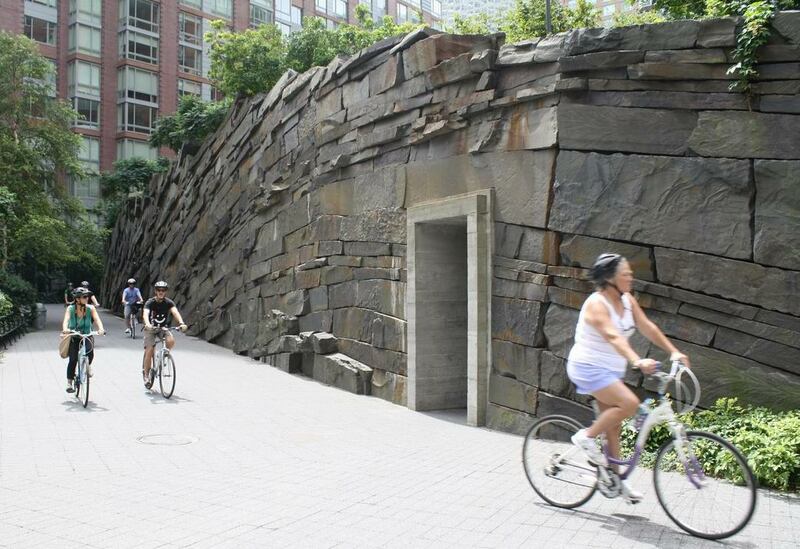 One of its prominent features is a vertical wall of stacked bluestone, arranged to resemble natural rock strata. This design includes water seepage through a section of the wall, forming icicles in winter. 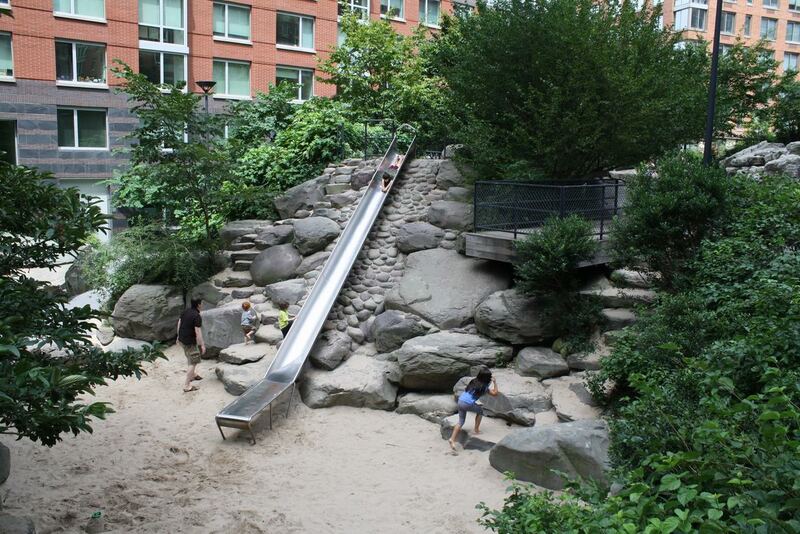 In the middle of the children’s play area, a long slide is anchored into a rocky hillside and terminates in a large sand area. 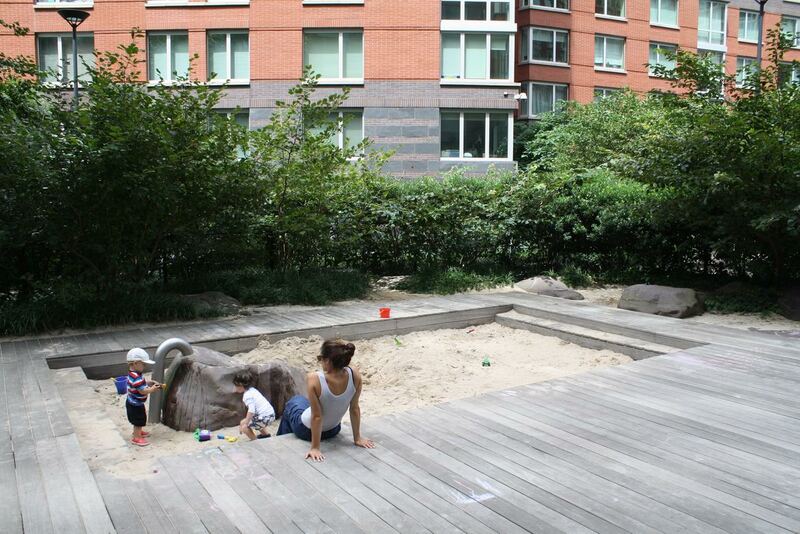 Nearby, there is a small sand play area for pre-school children, in addition to a water play zone for kids of all ages. 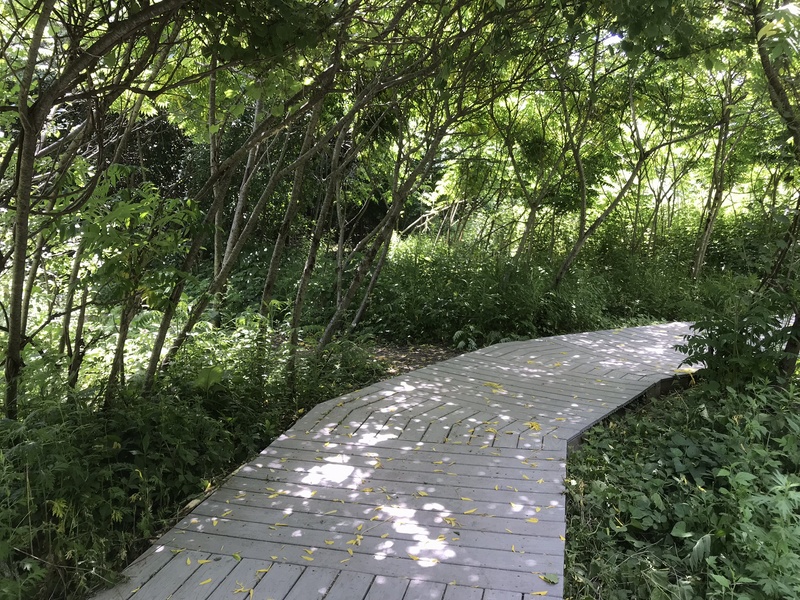 Children and adults alike can also explore a wetland play path, where I observed a number of birds during my visit. The sloping lawns to the north of the play areas are pleasant spaces for relaxation, and include several seating areas along the perimeter. 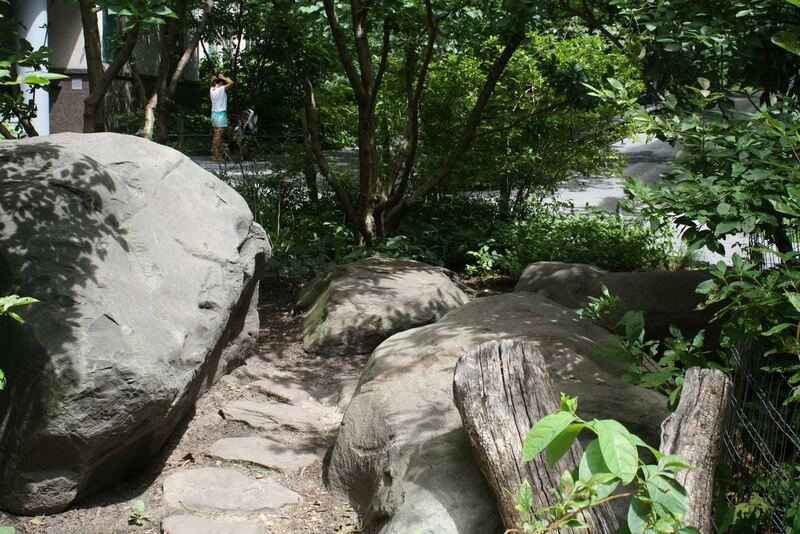 There are also some more isolated seating/gathering spots along paths throughout the park. Despite the secluded nature of those areas, I felt very safe while there. I was at the park on a Tuesday morning, so it was not packed with visitors. I would imagine that it attracts a lot more users during weekends and summer evenings, especially residents of the surrounding high-rises. 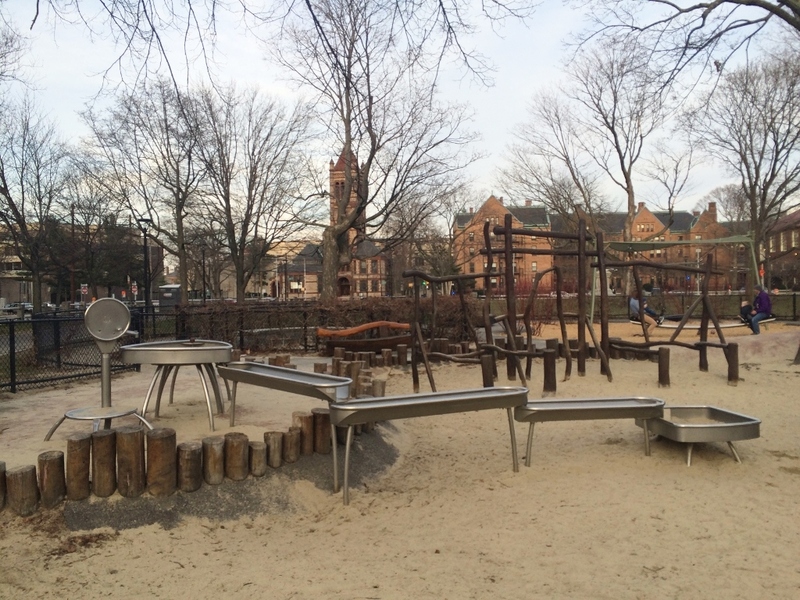 The park provides many opportunities for imaginative play for kids, and serves as a pleasant environment for all. 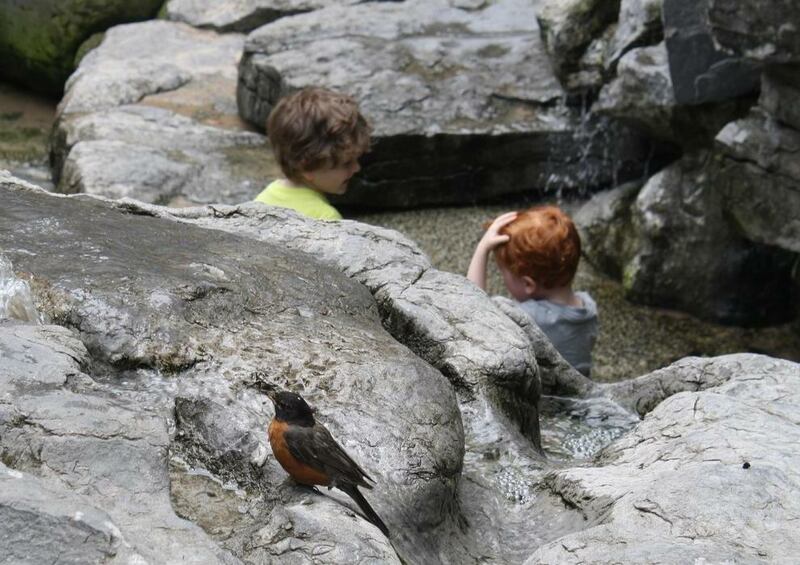 Wildlife in the water play area – the robin and the littlest boy are color-coordinated! The northern-most lawn area slopes toward the south to take advantage of the sun.